A conference table is used for multiple purposes such as office luncheons, client presentations, and team meetings, so you want to make sure you have the right one for your boardroom or office space. A long rectangular table works great in large rooms while a round table makes sense for small rooms used for quick meetings. 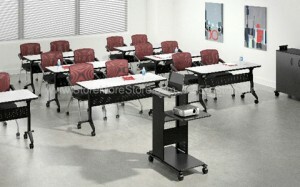 At StoreMoreStore we have a wide selection of conference tables to meet your specific requirements. Rectangular Conference Tables– Whether you’re looking to seat a large group or a few people, our 30’ or 6’ tables will work for you. They combine traditional styling with several technology-friendly features. You also have a choice between two beautiful finishes, Sierra Cherry or Mahogany. Boat-shaped Conference Tables– Our 10’ conference table is perfect for the office meeting or to spread out paperwork. It combines fashionable aesthetics with unparalleled quality in a package that is surprisingly affordable. This table includes 2 grommets and accepts power module for power and data access to operate computers and presentation equipment during meetings. Round Conference Tables– The 42” or 48” tables have a transitional style that allows them to fit into any environment whether it is a modular multi-station work areas or executive office while providing exceptional abrasion and stain resistance along with technology and cable friendly components. 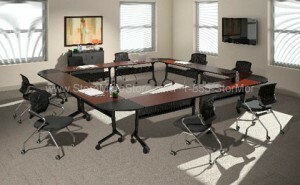 Racetrack Conference Tables– These tables are available in either 8’ or 6’ widths. There are two equally beautiful finishes to chose from, Cherry or Mocha. 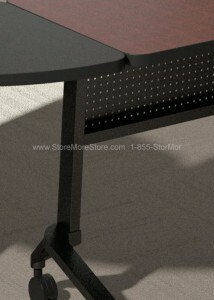 Both tables come standard with grommets; the 8’ tables with two and the 6’ table with one. 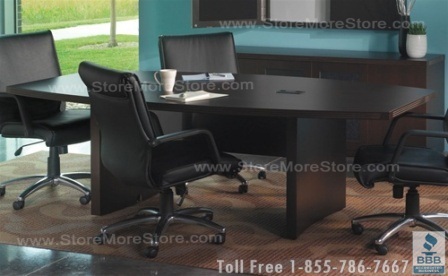 Shop online now at StoreMoreStore to choose a functional and attractive conference table for your office or boardroom today! If you have any questions, give us a call at our toll free number 1-855-786-7667 or send us a message. 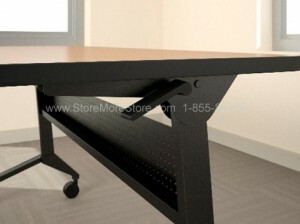 Every organization needs tables for those occasions when large groups require access to a worksurface at the same time. Training, meetings, collaborative projects, and company parties/special events are some of the common situations where tables come in handy. Then, sometimes you need to pack one up for a trip to a job fair or industry convention. You need a table that’s easy to set up, easy to break down, and easy to transport. 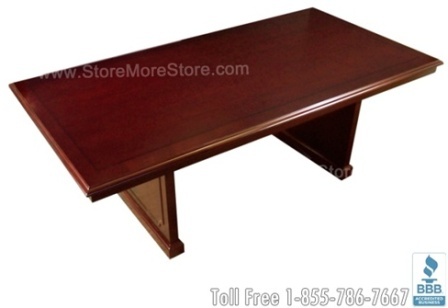 Typically, businesses turn to a standard banquet style folding table to meet these needs. We all know what happens when you try to use those. It’s a two person job…and not a pleasant one. First, someone’s fingers get pinched in the hinges. Next, someone else can’t get the leg to click into place. So, they start kicking at it causing the support strut to bend or breaking a rivet. You think the table is stable and find out it isn’t really fully locked when it starts collapsing. 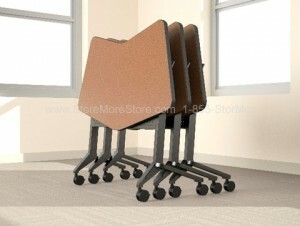 Finally, when you close the tables up and try to stack them against a wall, they all start sliding down to the ground. What’s the Solution? Nest-N-Stack Table! You need a folding table that isn’t so hazardous to operate. That’s why we recommend the StoreMoreStore Nest-N-Stack Series Tables for our customers. The Nest-N-Stack tables combine the stability of a permanent upright base with the convenience of a folding top. There’s a safe, simple lever mechanism that can be operated from either end of the table (by one person) to flip the top into a vertical position for storage. 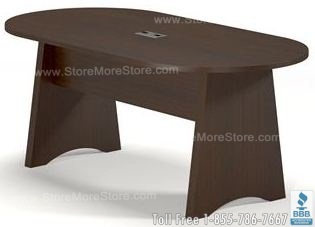 The legs are equipped with casters that let you roll the table wherever it needs to go. The bases have an offset design that allows them to nest close together, taking up very little room. Plus, you’re not stuck with just rectangular pieces. You can combine standard table shapes with curved and angled tables or pie connectors to configure your meeting or training space for maximum efficiency. Each table is data-ready with a cable trough built in to the modesty panel. It’s all very modern. Basically, StoreMoreStore is doing for tables what Maytag did for laundry – and we’ve got it all available at StoreMoreStore!